This object is currently on display in room 107 as part of Tablescapes: Designs for Dining. There is one other image of this object. See our image rights statement. This is a Drawing. It was manufactured by Lefebvre Manufactory, Tournai. We acquired it in 1931. Its medium is brush and yellow, red, green, black watercolor, pen and black ink, on cream laid paper. It is a part of the Drawings, Prints, and Graphic Design department. 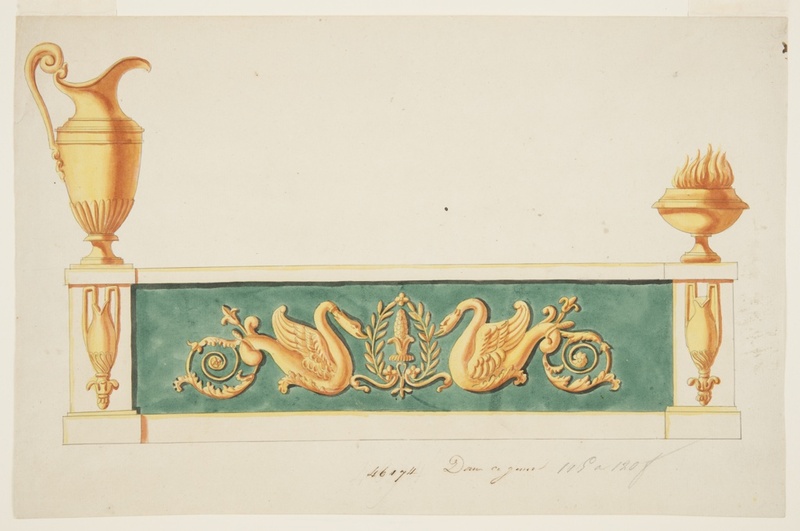 The swan motif on this andiron design shows a connection to the favored motifs of the French Empire and their impact outside Paris. It also shows classically formed urns, a pitcher, and perfume burner—objects more typically associated with the table—as part of the design.